A convertible option is now one option buyers can get with the upcoming smart fortwo electric, which made its American debut at this year’s New York Auto Show. The smart fortwo is one of the smallest vehicles on the road today. Less than nine feet long and barely five feet wide, you could easily park two smart cars one behind the other in a parking stall. You don’t even have to parallel park into a tight parking space; you can simply drive into the spot, front first. To get out, you just back out into the street and turn sharply into the direction of traffic. At over five feet in height, all but the tallest person can sit comfortably in the fortwo. The smart fortwo’s diminutive size makes it an ideal commuter car for urban areas with narrow streets and minimal parking, both on and off the street (e.g., San Francisco, New York.) Mercedes-Benz, which manages the smart brand here in the U.S., states an electric version was always planned for the car. The first smart EV prototypes hit the streets of London, England in 2007. The next generation of smart EVs then became available worldwide in 2009. 250 of the EVs were shipped to the U.S. for early adopters and the carshare program, Car2go. Mercedes says the fortwo electric gets 122 miles-per-gallon equivalent, or mpge, in city driving, 93 mpge highway, and 107 mpge combined. 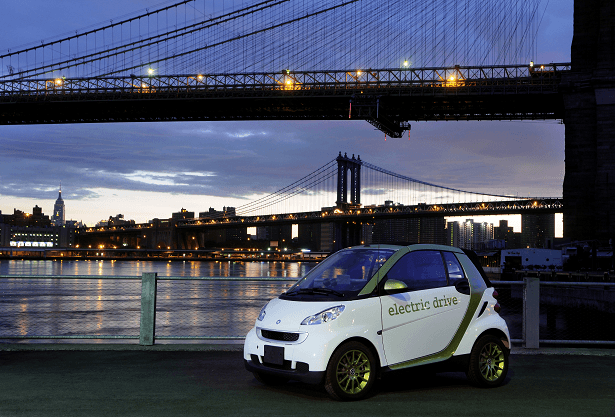 The EPA has tested the smart fortwo electric and gave it a range of 76 miles. Recharge rate of the lithium-ion batteries takes around six hours with a 204-volt outlet, though it can recover up to 80 percent in three hours or so. Recharging with the 110-volt outlet standard here in the U.S. takes considerably longer. As previously mentioned, the smart fortwo electric will be available as a convertible as well as the standard coupe. Starting price of the 2013 smart fortwo electric begins at $25,000 with the convertible priced at $28,000. In comparison, the popular 2013 Nissan Leaf EV is priced at $28,800 for the base S model while the 2012 Mitsubishi i-MiEV has an MSRP of $29,125 for base ES model. These prices do not include destination and delivery, or incentives like the $7,500 tax credit from the federal government and any additional rebates from the states.